The base, pressure cylinder and oil deposit form one integralpart and provide more strength and safety to the jacks. Quick and easy maintenance. With carrying handle. 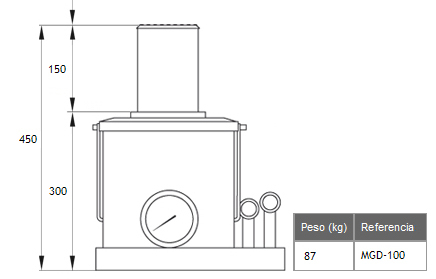 The MGD-100 model is fitted with pressure gauge and a two-piece handle. The MGD-100 jacks is fitted with two pumps (approach and operation).